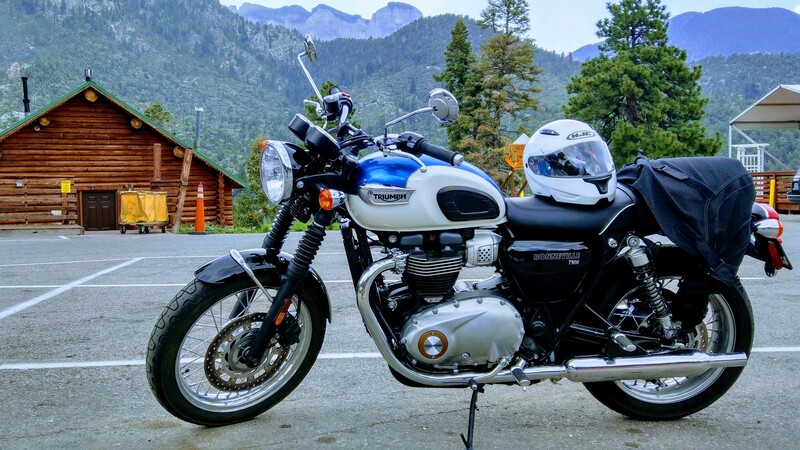 This is just a quick review on the 2018 Triumph Bonneville T100. Mrs OnTheBackWheel and I were lucky enough to hire one for a day in Las Vegas recently. We took it out for a whole day, out to Red Rock Canyon and on to Mount Charleston. It was a big day of riding so we got a good idea of its pros and cons. First up, I think its absolutely gorgeous. The paint work is fantastic and the fit and finish overall is brilliant. The instrumentation is simple, well laid out and easy to use. Nothing fancy, but it looks good and gets the job done. Seating wise, I had no dramas putting both feet flat on the ground and the bike itself felt pretty light. I liked the seat, it was like a lounge chair for me, especially compared to my Tuono (thats not saying much). My wife and I were riding two up for the day and she didn’t mind the seat for the first half of the day, but by the second half she was completely over it. It was 45 degrees Celsius though which never helps. To be honest, we were both pretty knackered at the end of the day. Boy it gets hot there! I dug the sound of the bike, especially for stock pipes. Its not loud, but when you are accelerating there is a lovely v-twin note. The engine has a small vibration to it when you are sitting still, but when you are riding it pretty much goes away. I thought the bike would lack power, especially for two up riding, but I found it to be fantastic. Its only a 900, and on paper its nothing to write home about. But really, this kind of bike isn’t so much about peak horsepower as it is about torque. I found myself just using the lower to mid range a lot and grunting around, rolling the throttle on (and loving it). When it came time to overtake, we didn’t have any dramas. We were cruising around on the open road in the 55-60 mph range and it was great. I opened it up to about 85 mph and it did start to run out of puff up top. The suspension was supple and soaked up the bumps well. We didn’t push it through the corners but certainly weren’t hanging around. I would have liked more stopping power from the brakes. They were adequate, but not brilliant. The throttle response overall was very good. There were no jolts and overall it was buttery smooth. I did find it very fluffy off bottom at times. It even caused me to stall the bike once, I went to accelerate and nothing really happened. It happened a couple more times but I was wary of it so I was able to stop it by pulling the clutch in. It was 45 degrees Celsius which never helps, but I think pipe and tune would be needed to fix this up. Previous How to change your Chain & Sprockets for Dummies!